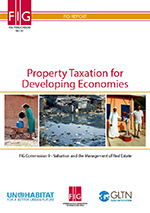 The International Federation of Surveyors (FIG), and Commission 9 (The Valuation and Management of Real Estate) are proud to present Property Taxation for Developing Economies, by Frances Plimmer and William J McCluskey. This work promotes the careful consideration of a transparent, fair, fast and relatively cost efficient real estate taxation system that could be applied successfully in some developing and transitional economies. Many advanced economies rely upon a complex ad valorem property tax regime that inherently requires relatively high cost and expertise levels. The authors propose the consideration of a less costly and more easily established banding system and discuss how and why this system may be introduced into jurisdictions which lack the necessary resources to implement a more complex discrete ad valorem assessment system. This publication touches upon the various types of taxation common among national economies and narrows its focus specifically upon recurrent property taxes. The authors examine the primary social need for a recurrent property tax, various taxation systems, the data, resources and skills necessary for its implementation as well as ongoing maintenance and social acceptance factors, as a setting for any successful tax regime and economy. Within Great Britain and Ireland, a very cost and time efficient system was needed to overcome some of the barriers in creating a complex discrete ad valorem recurrent property tax system. From this need, a banding system, was born. A property value banding system allocates properties into different categories (or Bands) according to an estimate of some value based criteria as a basis for the property tax bill. Instead of valuing properties to a discrete point, the property values are estimated according to a range of values (Bands). Based on the level of available data, resources, economic, social and political realities, banding should be considered as a possible and proven system for producing a speedy, transparent, fair, cheap and robust tax base. This work considers the benefits of its wider application across nations in a theoretical discussion as well as examining case studies showing how this system has fared in jurisdictions where it is currently being applied. These case studies expand upon the theoretical discussion by allowing real world experience, to highlight the strengths and weaknesses of its application in other countries. The primary focus of this publication is the application of the banding system, and this is considered in comparison with discrete ad valorem taxation systems with greatest emphasis on residential properties. Residential properties make up the bulk of the real estate tax base in most regions and a greater flexibility in banding or emphasis on discrete valuation is likely more appropriate for commercial and unusual property types. The relative benefits of the banding system should be carefully considered as either a long term or interim solution in an emerging economy’s development toward sustainable property taxation. 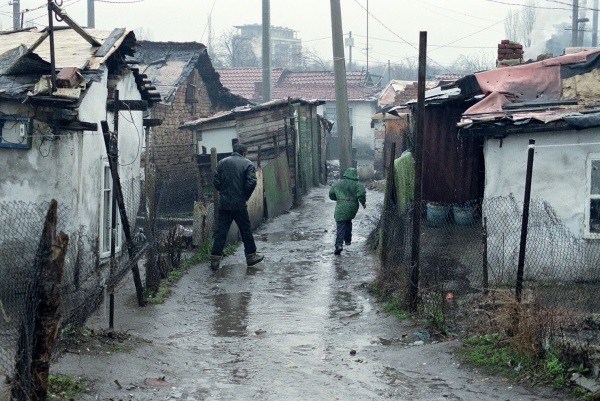 The work herein gives a clear picture of these two systems, and provides an excellent resource for decision makers to consider how they may apply in other countries. This work significantly enhances the current body of work on recurrent property taxation and is a valuable tool for decision makers at all levels. The main objective of the Global Land Tools Network is to contribute to poverty alleviation and the Sustainable Development Goals (SDGs) through land reform, improved land management and security of tenure. This publication discusses a practical and resource-led approach to implementing an efficient and effective system of taxing real estate in order to raise funds to pay for much needed community services for the benefit of local inhabitants. The focus is on developing a system based on available resources, rather than a “wish list”, and recommends that the tax be paid by property occupiers (rather than owners) in the absence of a comprehensive land title register. Such a system can be both sustainable and scalable, and, with good governance together with the delivery of appropriate services, can enhance the quality of life and opportunities for improvement for communities. The support of the GLTN for this FIG publication demonstrates the continued commitment of both organisations to their common goal of delivering beneficial land administration systems for the improved financial, physical and social environments of the world’s disadvantaged citizens. The purpose of this publication is to promote discussion on a relatively simple, sustainable, speedy and cost-effective system of property taxation which can be introduced in jurisdictions with a paucity of the resources normally required to administer a more complex ad valorem property tax regime. This discussion takes place within the context of existing examples of Banded tax assessments and is based on the needs and the limited resources of the so-called developing and transitional economies. Community growth, in terms of environmental, economic and social development, is inextricably linked to the provision of public services which facilitate and enable groups and individuals to improve their circumstances. However, local government can generally only afford the provision of such services provided the community contributes in the form of local taxation, generally a levy based on the value (or some surrogate) of the real estate owned and occupied by individuals, companies and other groups. There is a wide range of different forms of local taxation applied throughout the world, but most rely to a greater or lesser extent on complex economic, technical and human resources. Similarly, to tax property owners, a comprehensive and up-to-date database of registered land owners is required. But how can local governments respond to the needs of their communities for public services when such resources are absent? This report demonstrates the development of a property tax system built around available resources, rather than a “wish list”. Two case studies illustrate the successful introduction of the Banding of tax assessments, in contexts where speed and low cost of introduction were critical, and where tax was imposed on residential occupiers (in the absence of a complete and up-to-date register of owners). Banding works on the principle of grouping together dwellings into various value (or some surrogate) bands and applying a rate of tax to each band. In this way, there is need for only minimal valuation skills and the process of banding can be achieved swiftly and cheaply. Provided the taxpayers can be satisfied with the extent to which horizontal and vertical equity are sacrificed (i.e. those in similar situations pay similar amounts of tax, and those in different situations pay different amounts of tax, as reflected in the bands), then a high degree of social acceptability for the system is likely. This can be improved by involving communities themselves in the process of introducing the tax as well as by extensive education of communities as to the characteristics of and reasons for such a tax system. By adapting the principles discussed in this report, jurisdictions can use their available resources to develop a tax system which produces a reliable revenue stream for the provision of much needed local public services in a speedy manner. The purpose of this paper is to promote discussion on a relatively simple, sustainable, speedy and cost-effective system of property taxation which can be introduced in jurisdictions with a paucity of the resources normally required to administer a more complex ad valorem property tax regime. This discussion takes place within the context of existing examples of banded tax assessments and is based on the needs and the limited resources of the so-called developing and transitional economies. (b) ‘Recurrent’ taxes on the value of, or some surrogate figure applied to, units of real estate, which may comprise ‘land’, ‘land and buildings’ or ‘buildings’. Other assets may be included within these definitions but only because of their (physical) attachment to the land etc. and because of the nature of the definition of taxable property, imposed by the individual nation’s legislation. Thus, for example, where the tax is imposed on ‘land and buildings’ or ‘buildings’ alone, the taxable real estate may include plant and machinery, pipes installed in the building for the supply and disposal of water, electrical services and other ‘chattels’ which have become an integral part of the building. This paper is solely concerned with such recurrent taxes which are imposed in almost all countries across the world, and which in this paper are called ‘property tax’ (Bird and Slack, 2004; McCluskey, 1999). All taxes are a creation of national legislation, (they do not exist in common law), and the specific details of the property tax imposed in any jurisdiction are contained in the relevant body of legislation. In many countries, the body of law which relates to such taxes includes government regulations issued in accordance with existing legislation and judicial interpretations of legislation. The tax payable is a factor of the level of tax imposed (or the rate of tax) and the assessed value (or some surrogate of the value) of the property to be taxed. The calculation of tax payable is, therefore, a simple calculation of rate of tax multiplied by the assessed value. For example: a 10 cents in the dollar rate of tax and an assessed value of $5,000 produces a tax bill of ($0.10 * $5,000) $500. The tax rate is determined in accordance with national legislation, normally by either national or local governments or a combination of the two; where, for example, national government fixes the rate of tax and individual municipalities may have the power to vary this rate by a given percentage (often within a narrow range). a non-value assessment, which may be the product of a formula based on such ‘value influence’ factors such as age, use, location, and (net or gross) usable area. There is, however, a huge variation in the nature and structure of property assessments across the world, and for further information, readers are advised to consult more detailed texts on the subject, such as McCluskey et al., (2013) and Slack and Bird, (2015). In some countries (for example, China, Botswana, Lesotho), such taxes are imposed within urban areas only. In some cases, (e.g. Australia, the United Kingdom and the United States), different states, jurisdictions or cities within the country operate different forms of property tax systems. Indeed, the huge variation of property taxes imposed in countries around the world makes any generalisation of specifics extremely hard. Thus, it is clear that, in terms of property taxation, no one size fits all. A property tax system which works well in one jurisdiction may not be transposable to another with equally successful results. Differences in socio-political aspirations, perceptions of and traditions relating to land rights, infrastructures, available resources, history, needs and cultures all have an effect on the type of property tax which will or will not work for the stakeholders involved (UN-HABITAT 2011b). Regardless of national etc. variations, the principle which seems to underpin such taxes is that their revenue (generally supplemented by additional central government funds) supports local services which benefit both individuals, their real estate and their wider community, in terms of improving the quality of life of residents and increasing the value of real estate. It is also recognised (UN-HABITAT, 2011a) that taxation can be a tool to manage land use and urban development, as well as a means to recoup increases in land values which result from the range of taxation and other government policies. National legislation is likely to be responsible for identifying the nature and range of services which are to be provided by local authorities. Where there is flexibility within 8 the system for the municipalities to vary the level of tax raised, there may also be the opportunity for discretion as to the nature and quality of services provided. In this way, such a system is able to respond to calls for increased or varied service provision, recognising a degree of local democratic accountability between the local taxpayers and the local authorities. The rights which are fundamental to property ownership and occupation have significant ‘value’ attached to them and this ‘value’ is directly linked to the benefits which owners and occupiers received from the quality of their immediate and wider locational environment. Such an environment is maintained and improved by the services provided by the municipality which is the recipient of the yield of the property tax thus creating a clear and perceptible link in the minds of taxpayers as to the benefits which tax paid bring. (Plimmer and McCluskey, 2012a; 2012b). A property tax which reflects the up-to-date ad valorem ‘value’ of real estate and which is charged on an annual basis is therefore considered to be an integral part of a balanced national taxation regime (IAAO, 2010). It is generally recognised (IAAO, 2010) that an up-to-date ad valorem tax base provides the ‘best’ system of spreading the tax burden across taxpayers based on their relative wealth in terms of their real estate holdings, and thus maximising ‘fairness’ between taxpayers. Such a tax base should be subject to annual revaluations so that the share of the tax liability between taxpayers is continually adjusted to reflect the relative movement of property prices in the market. In countries where there is a mature property tax, which is levied on the market value of real estate, where collection rates are high (e.g. above 95%), where there is a culture of tax payments, and where society is provided with useful, well organised and beneficial public services, there is of necessity a large, efficient and effective resource base to support the tax regime of assessment, billing, enforcement, payment–as well as service provision (Bahl and Wallace, 2008; Bahl et al., 2010). a government which is responsive to changing circumstances and which ensures that the legislation under which the property tax is imposed is up-to-date, comprehensive, coherent, and appropriate for the needs of all stakeholders. In order to obtain such data, personnel and technological resources are required to gather and analyse relevant information and, in the case of the assessment, a high level of professional expertise is necessary. Similarly, complex technology to support its administration is also important for effective and efficient management of the process. All this, of course, costs money, not merely in terms of capital expenditure, but also in terms of on-going maintenance (as well as the costs of the education of human resources). For financial and other reasons, many governments are unable to develop and maintain such a system for the raising of property-based taxation. In such cases, where no or limited funding is available for public services, the demand for the full range and quality of public services from communities continues unsatisfied, with the potential for social resentment and unrest. Where the necessary resources to produce an ad valorem tax base are lacking, some surrogate non-value-based assessment must be relied upon, or, as in the case of Great Britain in the early 1990s and the Republic of Ireland more recently, where cost and speed were major considerations (refer the Appendices). We therefore hypothesise that where a paucity of necessary resources is the major barrier to the introduction of a property tax system, or such a barrier prevents the improvement of a limited or unsatisfactory tax regime, a simple system based on the banding of properties which reflects the available data and resources could provide an opportunity to achieve revenue from land ‘value’ and thus income for municipalities to improve the economic, social and physical environment of their citizens. This publication discusses some of the basic criteria which are normally considered to be important in a real property tax; the issue of necessary resources is then discussed. The focus of this paper on a system of ‘banding’ taxable units is explained together with an analytical reflection as to how this system might be introduced into jurisdictions which lack necessary resources to implement a more complex system of discrete ad valorem assessments. Finally, two case study examples of banding in practice are presented in the Appendices. These discuss how and why banding has been introduced and implemented within two jurisdictions, together with the perceived benefits and disadvantages. The experiences from these case studies are referred to, as necessary, in the earlier parts of this publication. Copyright © The International Federation of Surveyors (FIG), March 2016. 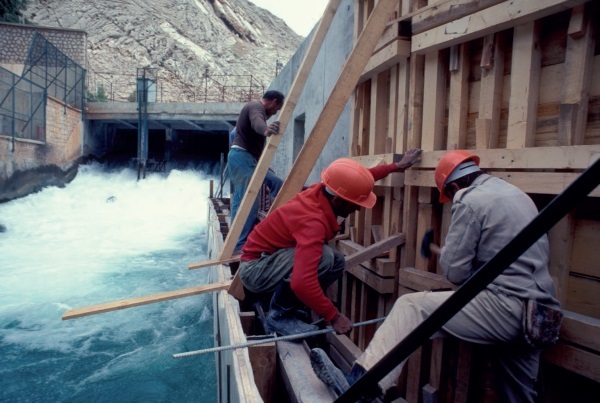 All images are the copyright of the World Bank and used under their terms and conditions.